A pair of twins born in San Diego will forever share different birthdays — and different birth years. 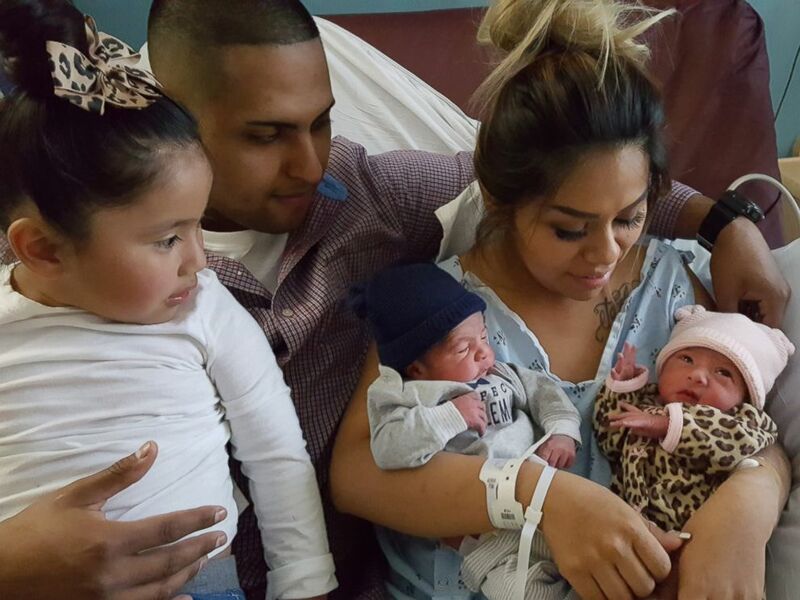 According to Abcnews, Maribel Valencia, 22, gave birth to daughter Jaelyn at 11:59 p.m. on New Year’s Eve, then delivered son Luis two minutes past midnight at the San Diego Kaiser Permanente Zion Medical Center, hospital spokeswoman Jennifer Dailard said Saturday. Jaelyn weighed 4 pounds, 15 ounces, while Luis weighed 5 pounds, 9 ounces, Dailard said. The two new additions join Valenica, her husband Luis and their 3-year-old daughter Isabella, Dailard said. “It’s a big blessing to have two of them, [a] boy and a girl, for New Year’s,” Luis Valencia said, according to ABC affiliate KGTV in San Diego. Can they still be referred to as twins? Anyways the important thing is they are born! Wo this is so hilarious, love this twin with different year of birth..
Lol,this crious…! first time I hear of such.